Earth science covers a large range of disciplines, especially geology. Geologists and other specialist geoscientists study the Earth from both a physical and historical perspective. Physical geology examines materials (e.g., rocks) and processes that have come to build and shape the planet. 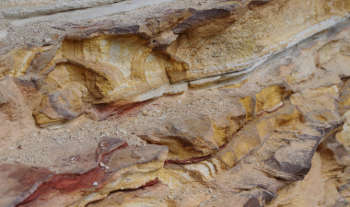 The historical aspect of geology focuses on the origin and development of the planet through its 4.5-billion-year history. Students enrolled in various undergraduate courses (including non-scientific courses) can study earth science at UNE. This site will provide you with important information about the discipline at UNE, including undergraduate study and research. Why Study Earth Science at UNE? Our society is completely dependent on the responsible use of the Earth's mineral and energy resources and there is a growing need to understand and minimise the environmental impacts of their exploitation and use. Mineral and energy resources are some of Australia's largest export earners and will continue to be fundamental to the socio-economic well-being of the country in the future. UNE has a long history of teaching and research in earth science and is conveniently located in the heart of the New England Fold Belt, providing an excellent natural laboratory for studying all aspects of the discipline. What makes studying earth science at UNE unique is that we offer our subjects in both internal and external modes, allowing students to study from home, no matter where you live in Australia, or indeed, the world! This is often ideal for students who work part-time or full-time. The external study mode is achieved through the world wide web as many of our subjects have their own personalised website, with access to all necessary subject materials, e.g., readings on eReserve. The websites also include discussion boards to promote interaction between students and academics, as well as a facility to submit assignments electronically. The practical components of our subjects, e.g., lab classes and lectures, are conducted during residential schools. UNE is also an excellent academic environment for students to conduct research in earth science at various levels, e.g., Honours, Masters and PhD. Academic and Honorary staff members within Earth Sciences at UNE are highly qualified and respected researchers in their related fields. Research projects can be tailored to individual students. Students may wish to choose field sites that are local, interstate or overseas. UNE is also well equipped with modern research facilities (see 'Facilities' below). UNE and the University of Newcastle have joined forces to create a coherent program in earth science, with both institutions offering specialist units to allow for a well-rounded geoscientific education. UNE students co-enrolled in earth science units at the University of Newcastle will graduate with a strong degree in earth sciences and have a clear advantage over graduates from other institutions that do not provide a comprehensive coverage of the discipline. Acid lab: acid leaching of carbonate and siliceous rocks using acetic, hydrochloric and hydrofluoric acids to extract fossils.